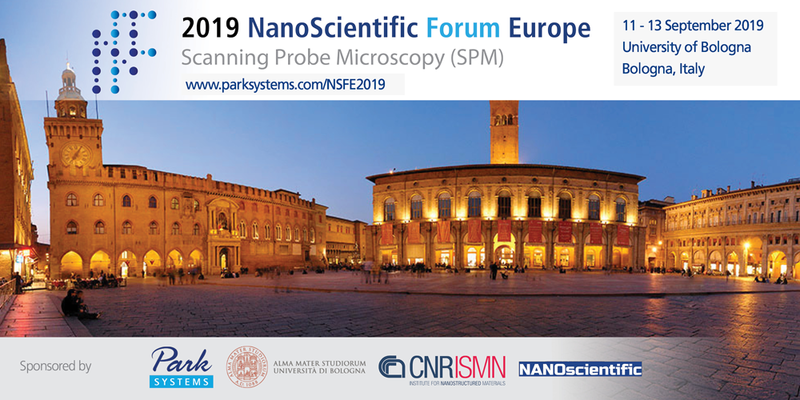 Park Systems and University of Bologna are proud to announce the 2nd NanoScientific Forum Europe 2019 (NSFE 2019) on September 11 – 13, 2019. After the successful first edition in October 2018 at the TU Freiberg, Germany we are happy to invite scientists and researchers working in the field of Atomic Force Microscopy to beautiful Bologna. The NSFE 2019 will be hosted by Tobias Cramer, Department of Physics and Astronomy of University of Bologna (UNIBO), and co-organized by CNR-ISMN Bologna, Italy. • Creating a platform for AFM users around Europe. *As a flagship research of UNIBO and CNR in Bologna, a special session will be dedicated to the characterization of novel semiconducting materials with multimodal scanning probe microscopies. It will highlight how scanning probe microscopies are fundamental to investigate such materials at the nanoscale and to untangle their diverse electronic, mechanical and chemical properties in multimodal imaging experiments. • Direct Electrical Neurostimulation with Organic Pigment Photocapacitors. • Nanoparticle gated semiconducting polymer for a new generation of electrochemical sensors. • Transport properties of Si based nanocrystalline films investigated by c-AFM. • Electrically Controlled “Sponge Effect” of PEDOT:PSS Governs Membrane Potential and Cellular Growth. • Direct imaging of defect formation in strained organic flexible electronics by Scanning Kelvin Probe Microscopy. Please fill in the registration form and your choice for hands-on-sessions. The invoice will be sent to you via email. Please prioritize from 1 to 6, which Hands-on-Sessions are of your most interest (1- the smallest note; 6- the highest note). You will be signed up for the highest scored sessions. The best paper will be awarded with an AFM Scholarship from Park Systems and acknowledged with a featured article in NanoScientific Journal. *To be able to take part in the image contest we kindly ask you to register to the conference. Every submitted image will be included and presented in the image contest during the conference. The best image will be awarded with a prize and a certificate.